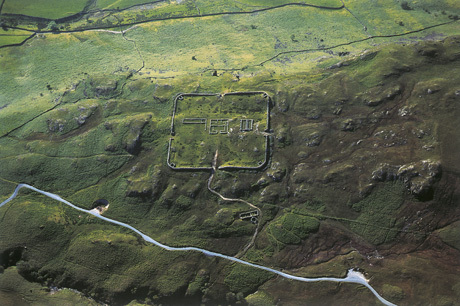 Hardknott Fort, at the western end of Hardknott Pass, is one of the most remote and dramatically sited Roman forts in Britain and is well worth the 30 minute drive from Sykehouse Cottage for a look around and to marvel at the sheer tenacity of the Romans. Though I must point out that the road up to it is single track and that reversing skills may be needed if you meet another car! The stronghold was built early 2AD and an inscription says that the garrison was the 4th Cohort of Dalmatians, all the way from the Balkans. It was abandoned in the 3rd century and the stone was pilfered over a long period. However there is still enough to see the outlines of central buildings: the headquarters, a small temple and the commander’s residence. Also the remains of a bath house alongside the road leading up to the fort. We find it incredibly atmospheric and, as one of the tribe is a budding gladiator, it’s a perfect place to sit and imagine life 2000 years ago and perhaps … for a leisurely picnic! It is an English Heritage site and further details can be found following this link. Categories: Local History, Things To Do, Walking | Tags: children's activities, local attractions, local history, roman history | Permalink.